It’s been only three weeks since we last reviewed a cooperative game, but what can I say? If they keep us busy, there’s no way to fight them off. 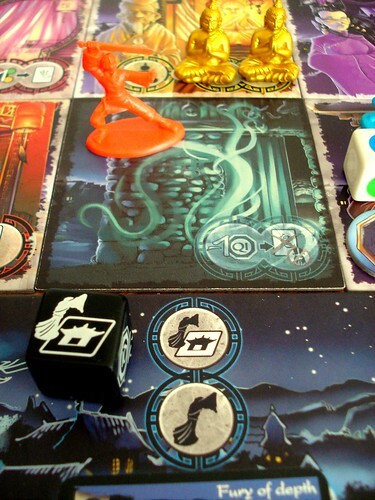 Compared to the previous coop we reviewed, Space Alert, Ghost Stories is downright relaxing. By the end of it, you’ll still be on the edge of your seat and chewing your fingernails. There may be wailing and gnashing of teeth in some games. Ghost Stories is so reminiscent of the Chinese Ghost Story movies from the 80s and 90s that I can only think of it as a homage to those movies, hence the title. Looking around the web while doing this review, I just discovered a new movie with the same title that’s going to be released in Singapore this April – can anyone enlighten me if it’s related to the old movies at all? Back on topic: just like in the movies, a Chinese village is under assault from demons, ghosts and other things that go bump in the night. The reason (unlike in the movies, as far as I remember) is the urn of Wu-Feng, an evil overlord, sorcerer and person that steals ice cream from children who was defeated and banished to hell in times forgotten and is now preparing for his comeback. The villagers are, understandably, panicked and ready to leave at the drop of an undead hat. 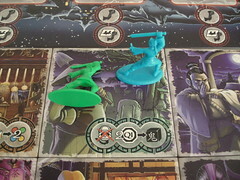 The two to four players are Taoist priests who happen to be in the area when hell breaks loose, and they are fighting hard to hold back the evil dead and defend the villagers. Each of the four priests has two special abilities, one of which you choose now, so picking your priest has an influence beyond determining your colour. 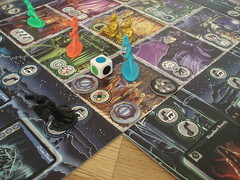 The yellow Taoist can either weaken the ghosts or save the day with his endless supply of ritual implements to help in exorcism, the red one can move other players or himself faster, the blue one can perform two actions instead of one (twice the same as one ability or two different ones as the other) and the green one has power over the dice. The special abilities are, unfortunately, not all equally useful. The difference is not big, but some combinations make the game harder. Nevertheless, the powers have a vast influence on the game and for a chance to win you will have to make good use of them, even more so than in Pandemic or Forbidden Island. The game “board” of Ghost Stories deserves some explanation as it includes many elements that are all relevant for the game. First of all, there is the village itself: the village is randomly assembled from nine tiles into a 3×3 grid. Each village tile is one location in the village, and the inhabitants of each tile have a different way to help you. In the Herbalists’s Shop, for example, you can obtain fresh ceremonial tools. At the Buddhist Temple you can pick up golden Buddha statues, your strongest weapon in the fight against Wu-Feng, and at the Cemetery you can resurrect fallen comrades – for a price. Next there is the game boards, one on each side of the village. Each board belongs to one of the Taoists, showing their colour and their special ability – you always play with all four, there is special rules how to handle them with fewer players. On each board, there also are three spaces to take ghosts – and they’ll be full soon enough. Next to the board, players keep their Qi tokens (representing their life, so when they run out it’s bad), their ritual implements in five different colours and their Yin-Yang counter that allows them once to bend the rules a little. There’s a lot of little paper tokens around in ancient China. So with all that paper going around, what do you do now? It’s actually pretty easy, on your turn, first of all … you watch the forces of Wu-Feng attack. If you have an empty ghost space on your game board, you draw a ghost card from the stack and bring it into play – if you have run out of free spaces, you just go ahead and lose one Qi marker. Ghost cards are clever little components with a lot of information on them. Beyond a name and an illustration they have a colour and toughness which becomes relevant when you’re trying to exorcise them. The ghost’s colours are the player colours plus black for extra nasty ghosts. Each card can also have up to three icons on the bottom edge for abilities that trigger when the ghost enters the game, has its turn or is exorcised. These abilities are what makes ghosts dangerous. On entering the game, they can block your special ability, make you unable to use ritual tools, cost you a point of Qi or summon another ghost – that last one is especially bad since it can (and does, more often than you would want to) chain. The most prominent ability on every turn is haunting – a haunting ghost will drive away one villager every few turns, making his ability unavailable and ending the game when it happens to the fourth tile. And they get a great, spooky looking gheeple (ghost meeple – I haven’t been fulfilling my contractual quota of meeple word contructions lately). Abilities on the ghosts’ turn are resolved before drawing a new ghost, so ghosts that just entered the game never use theirs. The last ability can be a blessing or a curse, depending on the ghost. The curse part is literal for many of them as they make you roll the curse dice that has a good chance of doing bad things to you. But some ghosts leave a reward when they are exorcised: Qi, ritual tools or even your Yin-Yang token back if you had used it already. Compared to all this, the players own turn is almost unremarkable: move to an adjacent tile, including diagonally. Then either take the help of the villager at your location or perform an exorcism. When performing an exorcism, you roll the colour dice: if you roll at least as many dice in the ghosts colour as the ghost has toughness points, the ghost is exorcised and it’s card removed. White is wild, and if you don’t roll enough you can use ritual tools of the right colour to improve your result – as can any other priest in the same location, a helpful bit of rules that is easy to forget. Note that an exorcism affects all ghosts next to you, so if you’re in a corner you can exorcise two smaller ghosts in one turn – a very important strategy to stay ahead of the tide of ghosts. Finally, if you’re carrying one of the two Buddha statues, you may place it on an empty ghost space around you: any ghost entering that space is destroyed by the statue without using any of his abilities – not leaving a reward, either – and the Buddha statue is returned to the temple. At any time on your turn, you can also use your Yin-Yang token to request help from a villager not at your location or restore a haunted tile, on top of your regular action. Although you only draw one ghost card on your turn, ghosts will start swamping you quickly and having enough space to place a new ghost instead of losing Qi becomes very challenging. And then, just when you think things cannot get any worse – 10 cards from the bottom of the stack – Wu-Feng shows up. Although you know when it’s going to happen, you are still in for a nasty surprise when he appears. Wu-Feng has ten different incarnations; some of them are positively benign, like the Dark Mistress, a three-resistance blue ghost that prevents players from using their ritual tools. Yes, Wu-Feng is male. Yes, Dark Mistress is not. No, Wu-Feng was not available to comment on his locked underwear drawer. On the other end of the spectrum, there is the aptly named Hope Killer, a real big fellow that has two points of resistance each in yellow, red, blue and green, and is all but impossible to get rid of alone. Some other incarnations require special conditions before they can be defeated, making them a general pain to exorcise because the game goes on until the incarnation is defeated – or until the remaining ghost cards are used up, at which point Wu-Feng fully enters the world of the living and resumes his reign of terror. If, after a few games, you think Ghost Stories is too easy for you, you can try yourself against up to four incarnations of Wu-Feng. Don’t expect to reach this point too soon, because Ghost Stories is not an easy game. Even on the easiest level, you will take a few tries before you defeat Wu-Feng. I know I keep saying this about cooperative games, but I can’t help it: you need to use all the tools you are given to win. Villager abilities, Taoist powers, Yin-Yang powers, all are needed. Strategy in Ghost Stories means sacrifice: the biggest trick to winning is to decide when to risk a roll of the curse dice or an additional monster cards, when to give up a point of Qi to rid yourself of a big ghost and sometimes even when to heroically sacrifice yourself to give the others a chance to defeat Wu-Feng. And even then it might not be enough. Ghost Stories requires quite a bit of luck to win. Even when you know what you are doing, a bad chain of ghost cards can ruin your game. As can a couple of botched exorcism rolls. And which incarnation of Wu-Feng shows up makes a big difference as well. Bad rolls can and should be guarded against by collecting the right tools and exorcising in groups, but that still leaves the other factors to consider. Ghost Stories, unlike, say, Pandemic, doesn’t become easy to execute after you grasped the general strategy. On the one hand that’s an advantage. On the other hand you will lose a few games without any fault of your own. One more factor that influences the difficulty of Ghost Stories is the number of players. Surprisingly, playing with fewer players makes the game a good deal easier. Since it’s a cooperative game and does suffer from the usual risk – one person assuming command and the others just executing her plan – it can’t be the other people playing badly that does it. As far as I can tell, the special rules for two or three players are to blame for this. For every missing player you remove some ghost cards from the stack, making the time until Wu-Feng shows up shorter. 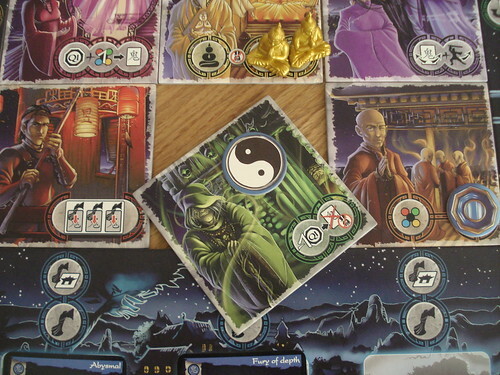 Even better, each player gets a token that lets him use the special ability of one of the Taoists not in play. This may not sounds like much, but the flexibility of moving two steps when you need it, just as an example, is a bigger advantage then you would think. Even with those things in mind, Ghost Stories is a very well-balanced game. You may sometimes lose because of bad luck, but you never lose the game early. Even in games going badly, you usually get to see Wu-Feng before you lose. And you usually will be drowning in monsters by that point even if the game is going well. 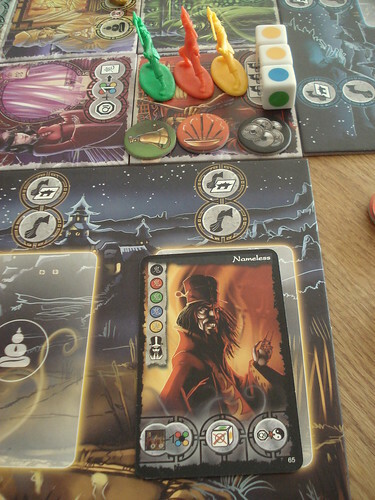 Your fate is always decided on the last few turns, making Ghost Stories a very tense game every time you play. Ghost Stories is also a gorgeous game. The illustrations of tiles and cards by Pierô give the game the right mood with their beautiful french comic style. The gheeple, preeple (you should be able to guess by now what those are) and Buddha statues do the rest to make the game pretty. The numerous kinds of counters,tokens and thingamabobs look a bit intimidating when first laid out, but nevertheless they look good. However, even with all the randomness, Ghost Stories is slightly less variable than other coop games. Sure, the village may look different, the ghosts show up in a different order and in the end a different incarnation of Wu-Feng eats your face, but all that is just things happening in a different way. The Taoists special abilities are the only things that change the narrative of the game and they have an effect on the difficulty at the same time. Despite that, Ghost Stories is a very tense and fun coop game, and the White Moon expansions adds a whole new layer of things that can go wrong – but more on that another time. And now I deserve a marathon of my Chinese Ghost Stories DVD box. Yuèdú ganxiè hé xià cì zàijiàn. If the Chinese is off, don’t blame me. Blame Google. From haggis to caber toss, Scotland is full of traditions that seem odd to an outsider. But the oddest tradition has recently been discovered by Günter Burkhardt: when the Scots build a castle for their clan, it’s not a collaborative effort like you would expect. Every builder wants floors in his or her own color to top of all the tower. The resulting castle is neither very hospitable to live in nor does it have great defensive value, but it is a home for your clan, and someone made a lot of money building it. There have been many different ideas to spice up trick-taking games over the years. Black Hat’s way to do that is to add a game board where you move your pawns when you take a trick. A lot then depends on proper timing, you want to take a trick when moving on the board is the most beneficial for you. I imagine that sometimes the pitch for a new board game must sound a lot like the pitch for the weird blockbuster movie of a year. “It’s a Patience game, only you can play it with friends and it’s about rescuing people from the Titanic.” It probably wasn’t an easy sale, but here it is: SOS Titanic, the multiplayer solitaire game with superpowers.